Your Wedding Wish Vase© encourages guests to write heartfelt notes to be inserted into the personalized handmade porcelain vase. Opened on the first anniversary to reveal the notes, it becomes a cherished keepsake. pottery vase to receive well wishing notes prompted by a poem that we wrote for the occasion. It was such fun opening our vase and reading all the wishes for us from family and friends. The notes and vase have become cherished keepsakes from our wedding day. 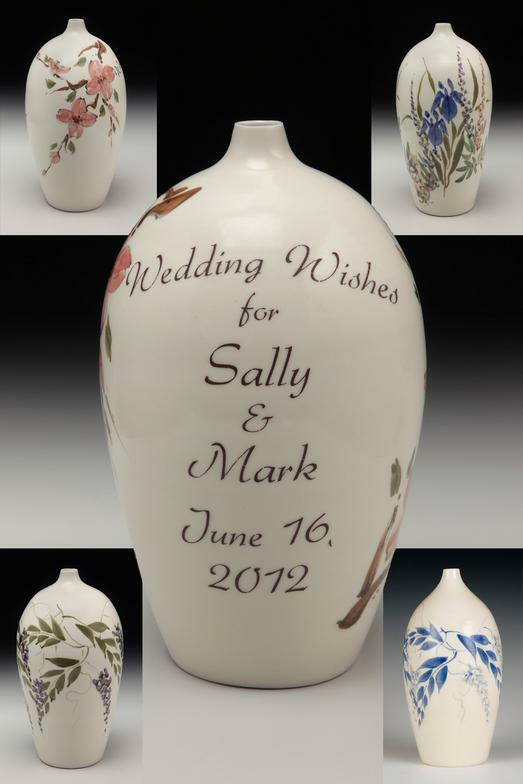 Vases were commissioned to give as wedding gifts and thus it spread across the country, one wedding at a time, becoming many couples’ favorite wedding gift. Now, many brides suggest them on their registry. But I limit one per wedding! PayPal, Visa, MasterCard, and American Express accepted. Standard vases available through David's Etsy site, click here.